This title was originally published by Open City Books, but we no longer publish or sell it. Celebrated English author Edward St. Aubyn’s brilliant and scathingly witty family portrait examines the shifting allegiances between parents, children, husbands, and wives. The novel’s perspective carousels between each member of the Melrose family - the same family featured in St. Aubyn’s trilogy Some Hope--starting with Robert, who provides an exceptionally droll and convincing account of being born; to Patrick, a hilariously churlish husband who has been sexually abandoned by his wife in favor of motherhood; to Mary, who’s consumed by her children and an overwhelming desire to not repeat the mistakes of her own mother. All the while, St. Aubyn examines the web of false promises that entangle this once illustrious family, whose last vestige of wealth--an old house in the South of France--is about to be permanently donated by Patrick’s mother to a new-age foundation. An up-to-the-minute dissection of the mores of child-rearing, marriage, adultery, and assisted suicide, Mother’s Milk showcases St. Aubyn’s luminous and acidic prose--and his masterful ability to combine the most excruciating pain with the driest comedy. Once Mother’s Milk is absorbed into the bloodstream of American culture, postpartum depression will never be the same again. Edward St. Aubyn was born in London in 1960. He is the author of the novels A Clue to the Exit and On the Edge and the trilogy Some Hope, which Open City Books published in November 2003. "Funny, insightful, and terrifically opinionated." "Marvelous... What makes St. Aubyn so extraordinary and pleasurable to read is how beautifully he writes, his acidic humor, stiletto-sharp observational skills, and an ability to alchemize these gifts into one quotable, Oscar Wildean bon mot after another. [St. Aubyn is] the kind of writer who makes you notice the terrifying family at the next table, and who makes you want to write." "Postpartum depression, assisted suicide, adultery, alcoholism--it's all here in St. Aubyn's keenly observed, perversely funny novel about an illustrious cosmopolitan family and the mercurial matriarch who rules them all." "A stylish, acerbic satirist of the English upper crust, now in its dwindling, twilight days. St. Aubyn may not be the next Evelyn Waugh so much as the next Anthony Powell, a chronicler of familial and generational change--or lack of it--in the loftier reaches of British society." "A millennial Evelyn Waugh . . . St. Aubyn has a wit that stings link disinfectant on a wound." "An elegant and witty satire on the dissatisfactions of family life . . . told in a fresh, acerbic way." "Told with slicing British wit." ‘Delightfully caustic… One of the novel's great pleasures is in its riotous, sardonic depiction of the English jet-setting upper-class at play… [St Aubyn’s] ability to convey emotional nuances underpinning the posh grotesques makes this beautifully written novel funny, disturbing and heart-rending." "An extremely good comedy. Patrick’s world-weary outpourings… are remarkable for their wit. 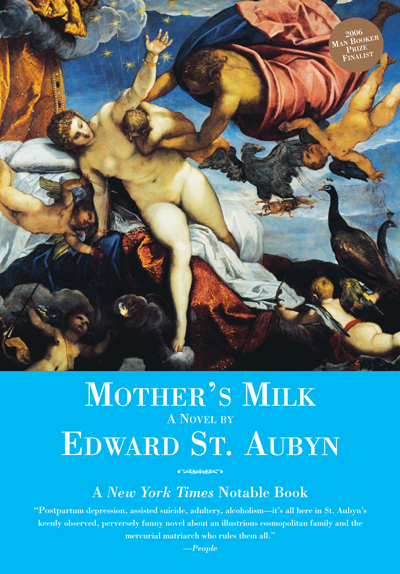 St Aubyn’s forte is the clever riposte and he is most effective when putting a fresh spin on stale sentiments… Mother’s Milk is a novel whose far-seeing insights and piercing humour make it a delight and occasionally an education to read." ‘For once, the hype is justified. This is indeed the re-emergence of a major literary talent." "If you have not already read [Some Hope], you are in for a treat for St. Aubyn is one of the best-kept secrets in contemporary literature… [Mother’s Milk] offers much scope for the Martini-dry comedy which is St. Aubyn’s hallmark. More dialogue-driven than descriptive, his prose demands to be read out loud… As with Evelyn Waugh there is much to amuse but hovering threateningly is a melancholy cumulus and the sense that a happy family is as rare as a ray of sunshine on the moon. St. Aubyn’s genius lies in his ability to make misery so entertaining. In Mother’s Milk he has upheld his very exacting standards and written what must surely be one of the most remarkable books of this young year." "The bravura quality of St Aubyn’s performance is irresistible… St Aubyn is terrifyingly good at sucking one into the vortices of despair… brilliant." "[An] extraordinary opening… St. Aubyn has a lovely and elliptical lyrical style. He captures perfectly the crisp Englishness of Patrick’s voice, and the strained back-and-forth of adulterous flirtation. There are beautiful turns of phrase… There are witty one-liners, and the scenes in Eleanor’s nursing home in which she begs for euthanasia are touching and desperate… This is a fine comedy of manners." "Beneath the veneer of satire and the mocking tone, St. Aubyn expresses wonderfully the unhappiness of a family whose past is ever-present." "The last section of Some Hope is as funny as anything in Waugh, and as astute about the micro-politics of status as the great Margaret Thatcher scene in Alan Hollinghurst’s The Line of Beauty. I laughed out loud reading many of the exchanges… [On Mother’s Milk:]… wonderful caustic wit… At its best--and most of the time this closely worked, sparkling novel is at its best--we are grateful that so much wit and attentiveness has been lavished on these slightly spoiled darlings and their navel-gazing offspring. Perhaps the very sprightliness of the prose--its lapidary concision and moral certitude--represents the cure for which the characters yearn. So much good writing is in itself a form of health." "The prose is stinging and poised… Mother’s Milk is one of the most savage views of family life ever delivered… But St Aubyn gives the news so clearly and so cuttingly that it makes nothing less than exhilarating reading. A small masterpiece." "Mother’s Milk is so good--so fantastically well-written, profound and humane… Its minute-by-minute interior monologues, its foetid, man-in-a-crisis confusions bring Updike to mind, while its social set-pieces, its brittle, poised dialogue, are as fine as anything in the work of his friend, Alan Hollinghurst. But there is also a new sweetness here, and at times, particularly when he is writing about children, it is heart-stopping." "2006 opens with a welcome return: Edward St Aubyn adds a 21st-century coda to his 1990s trilogy, Some Hope, with the beautifully written Mother’s Milk, which revisits the dysfunctional Melrose family to illuminate the very old, the very young and the middle-aged raging in between. Polished yet profound, it’s even better than his previous work, and that’s saying something." "In the early 1990s Edward St Aubyn published--to great acclaim--three novellas detailing the degenerate exploits of Patrick Melrose and his cruel aristocratic family. Now a long-awaited follow-up, Mother’s Milk, and a new edition of the trilogy, reminds us of what we’ve been missing… St. Aubyn is a staggeringly good prose stylist and evidently has a big and open heart. He intelligently contrasts Patrick’s spiritual redemption with the self-help cant of his mother’s guru, reminding us that sorting out childhood issues, finding peace through communing with nature and resolving to live better lives are not embarrassingly middle-class fetishes, but useful things for us all to do." "Reminiscent of John Updike and Iris Murdoch by turns, the resulting comedy of manners, morals and existential angst is bitingly satirical and unfailingly entertaining." "St Aubyn is admired by connoisseurs of good writing who relish his formal prose and fine metaphors as well as his portraits of the nasty rich. In fact, what is remarkable about his novels is that while they do not let anybody off the hook, the precision of the writing and the bleakness of the vision do not exclude warmer feelings, and this restricted and somewhat weird fictional world comes to have a wider sympathetic meaning." 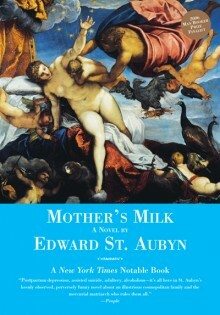 "[Mother’s Milk] has the cerebral excitement and piercing funniness of St. Aubyn at his brilliant best."